The Los Angeles freeway system is famous (or infamous) around the world. Our massive transit infrastructure co-existed with streetcars for a while – the original Hollywood Freeway had a streetcar line right down the center – but by the early 1960’s the car was king and there was no looking back. 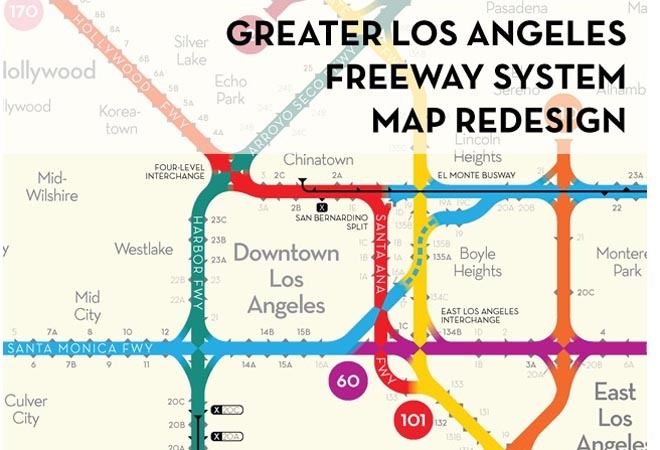 While we have a growing Metro system, and many folks that live and work in downtown don’t even own cars, most of us are intimately familiar with our favorite freeway routes and memorize them. Those Californians skits on SNL had to come from some kind of reality. The freeway routes on Dunn’s diagram are remarkably similar to a century-old map in the collection of the Electric Railway Historical Association archives. 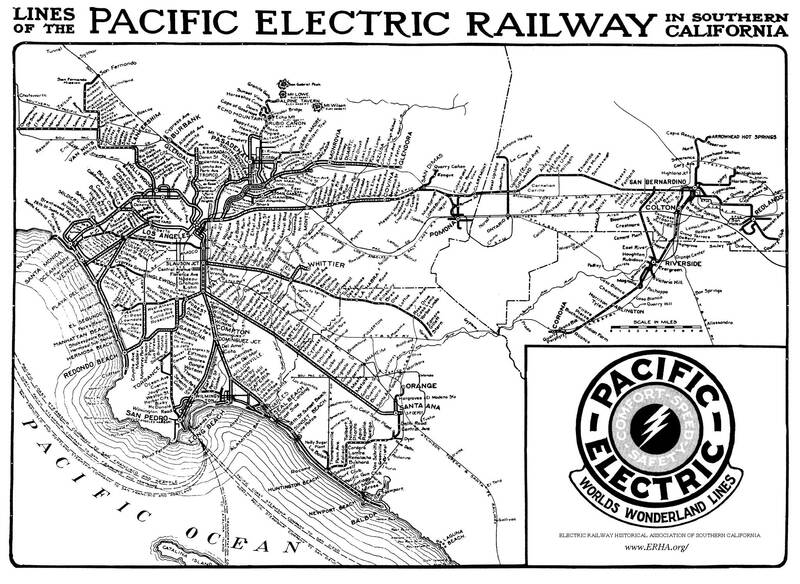 Henry Huntington’s Pacific Electric pioneered many of the routes that would become freeways. The future paths of the 5, 10, 110, 210, and 91 are remarkably clear. The first line of modern-day Metro Rail was downtown to Long Beach, nearly identical to the last line cut when the original system closed in 1963. Explaining the breadth and depth of the freeway system in this relatively clean way is perfect for someone trying to comprehend the city for the first time. Of course a map for Angelenos would include not only Metro Rail and Metro Link, but also the rich network of local transportation like Dash routes, the Pasadena ARTS shuttles, and the Big Blue Bus. Maybe it would add car-sharing stations operated by Zipcar and Flight Car. Why not put Uber and Lyft in there and see what happens. I’ll take the Metro on occasion, but I love driving my little yellow Beetle. Earlier this week I was stuck on the 110 chatting on the phone and complaining about traffic. I got some sympathy, but after a moment, I reminded both of us that I was seated in a recliner enjoying the air conditioning and the scenery passing by my windshield. Pledge $25 on Dunn’s Kickstarter and the designer will ship you a 24”x36” print. The postal truck will most likely take one of these freeways en route to your home. Previous articleIs ‘Normal’ Barbie Any Healthier?